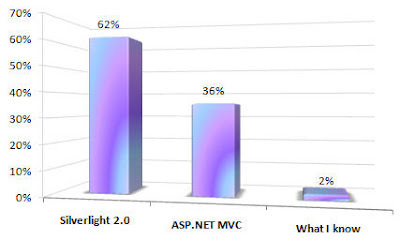 In a recent poll run on this blog, I asked you to tell me which new Microsoft platform you're most eager to use in 2008: Silverlight 2.0, ASP.NET MVC, or no new platforms at all. The results are in and it is of little surprise that the majority of you (62% to be precise) are most interested in using Silverlight 2.0. ASP.NET MVC trailed a distant second at 36%, and a meager 2% of voters have decided that none of the new web development platforms from Microsoft are interesting enough to try in 2008. These results are consistent with another survey run on this blog back in September where most voters indicated they are eagerly waiting for Silverlight 1.1 (now 2.0) to begin their development on the platform. It should be great news, then, that we're only weeks away from Mix08 and what is likely to be a deluge of new Silverlight 2.0 and MVC details. I will be in attendance with my Vegas blinders on, focusing intently on all the new details so I can bring you some great updates and presentations in the coming months. 'Til then, get your Silverlight fix by watching the recorded version of my recent Silverlight presentation in Second Life or by grabbing the slides and code from my Silverlight presentation in Florida. Also, be sure to vote in the new poll about .NET ORM tools.